The Philippines' ever bountiful endowment of breathtaking natural resources include amazingly lovely bodies of water, perfect for boating, snorkeling, jet-skiing, and yes... scuba diving. In fact, thousands of divers come from all over the world to the Philippines each year to explore what the country's deepest places have to offer. #1 - Puerto Galera: Located on the north shore of the island of Mindoro, Puerto Galera can be reached via a bus commute or private vehicle ride to Batangas pier and then, by sea ferry. Moreover, this terrific resort is known to be one of the most enjoyable beaches in the Philippines due to its crystal-clear water and world-class fun activities, such as scuba diving, surfing, snorkeling, sailing and swimming. Not so far from the coast, divers should be able to swim with schools of Moorish idols, frog fish, lion fish, leaf fish, etc. #2 - Anilao, Batangas: Anilao is comprised of 2 barangays, in the Mabini municipality of Batangas. Situated in the southern part of Manila and the Peninsula of Calumpang, it faces Maribacan Island. 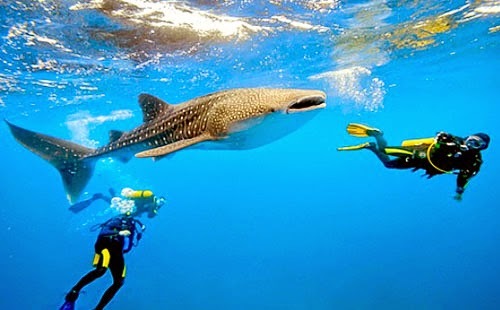 Divers never regret but fully get thrilled in this magnificent marine life, corals and diverse fish haven. Get there if you can by sea or land. Easily take a bus bound for Batangas City from the Makati Buendia terminal and ask to be dropped off at the Mabini/Bauan jeepney terminal. Then request a Mabini jeep driver to take you to the Mabini dock area. Once there, you can hire a driver to any of the resorts. #3 - Cabilao Island, Bohol: Explore the first-class nature's bounty of Bohol province, by experiencing diving at fantastic Cabilao Island. This captivating recreational place has a plateau at the dive spot called light house, that ranges from 22 - 35 meters, where you can view so many barracuda going around in circles. Furthermore, black and white tip sharks are also very common in this amazing spot. Not to mention, when you get really lucky, you may also meet one of the strong hammerhead sharks that would visit Cabilao at times. #4 - Apo Island, Negros Oriental: You thought you've done all there is to do in the Philippines huh? Think again! Why don't you hop onto the island of Apo for a splendid dive soon? Two stunning resorts are in store for you there, with dive centers, namely: Liberty's Lodge and Apo Island Beach Resort. Be there or be square! Daily flights are available in the Philippines from Manila to Dumaguete City. Also, ferries go to Dumaguete City every day, which are available for tourists coming from Cebu. #5 - Malapascua Island, Cebu: Don't be blue, let's go to Cebu! This supreme island province consists of the main island itself and 167 other islands and islets. In Malapascua Island, divers can regularly encounter giant Manta rays and thresher sharks. Absolutely priceless! The distinctive dive sites that are very popular there are the Monad Shoal and Gato Island. Be enthralled as well to swim with the following other sea creatures such as: sea snakes, cuttle fish, seahorses, nudibranchs, shrimps, crabs, ghost shrimp, pipefish, bobtail squid and so many more, you wouldn't want to leave at all! #6 - Tubbataha Reefs Natural Park, Palawan: This out of this world marine and bird sanctuary is found 150 kilometers southeast of the city of Puerto Princesa, which is the capital of Palawan. Declared by the UNESCO as a World Heritage Site in December 1993, Tubbataha Reefs Natural Park is proud of its 100-meter perpendicular wall, huge lagoons and two islands of coral. Astonishingly, in 2008, the reef was also part of the nomination for the New 7 Wonders of Nature. With these accolades, this 82,000 - acre invaluable gem, is thus a perfect destination for all scuba divers out there who would like to get the best of what diving in the Philippine seas has to offer. #7 - Taiei Maru Wreck, Coron, Calamian Islands: This unique diving site can easily be reached by very many sea explorers. Also called Okikawa Maru, it is one of the Japanese World War 2 wrecks lying in the waters near Coron. The positioning of this beautiful oil tanker is just 27 meters shallow and measures over 170 meters in length. #8 - Divers Heaven, Balicasag: You ain't seen nothing yet, until you arrive at Divers Heaven, at Balicasag Island. Located in Poblacion, Panglao Island, this exceptional diving place can be reached 10 km from Alona Beach, through a 25-minute motor boat ride. There are lots of coral heads to view there and several anthias, rock cods groupers, scorpion fish, squirrel fish, parrotfish, wrasse, anemone fish, et al. #9 - Crocodile Island, Boracay: Are you a first-timer diver? Then come and see Crocodile Island's beauty! Only 15 minutes away using a boat ride from White Beach on Boracay Island, this estimable diving wonder, presents its schools of reef fish, Nudibranch, Scorpion Fish, sea snakes, Fan Corals and many more. Boracay, you are indeed to die for! #10 - Honday Bay, Palawan: Escape if you may at Honda Bay, to bust all that stress away! This super fascinating bay is situated on the eastern shore of Palawan island close to the city of Puerto Princesa in southwest Philippines. Capture that incredible under-the-sea moment scuba diving in Honday Bay, within October till May - the best time to be in Palawan.